Trekking in the Cinque Terre is more than a simple trekking experience! The Cinque Terre trekking is a full immersion into the typical Italian landscape and traditions, it is the taste of mediterranean food, of Vernazza typical wine, the discovery of medieval art along paths on top of the cliffs, and even more than all of this. “Cinque Terre Hiking” is my three days trekking program in the Cinque Terre, a product of 30 years of experience as mountain guide in my country, Italy. The basic Cinque Terre trekking consists in three days where you walk some 6 hours per day, from village to village, but it is possible to extend it up to 6 days and reach the town of Sesti Levante to complete the crossing of eastern Ligurian coast; or, even better, to go till the town of Finale Ligure where we can spend some days rock climbing in this amazing area with a climbing course and the Via Ferrata degli Artisti (Artist’s Via Ferrata). Arrival at one of Milan airports: Malpensa, Linate or Bergamo Orio al Serio. Here you will meet me at outside the international flights terminal, and after the introductive briefing with a good Italian espresso coffee, we shall go to Portovenere, our starting point. 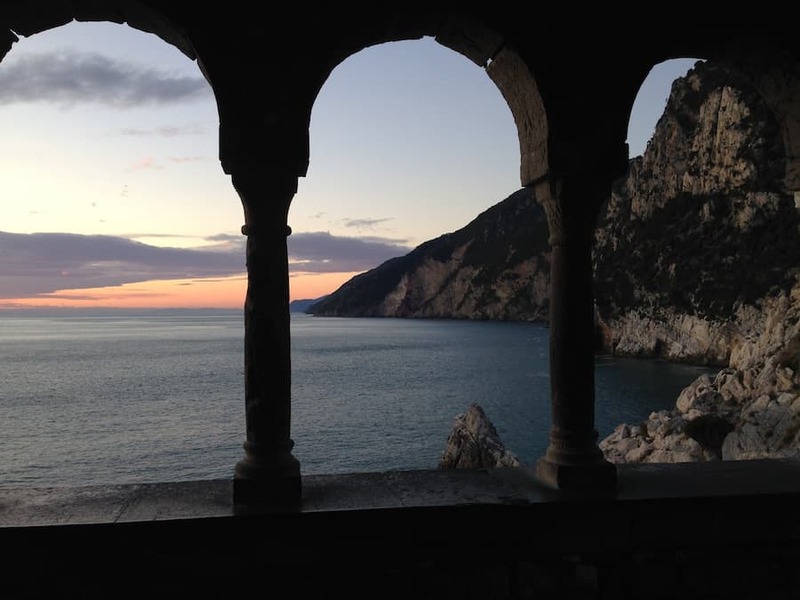 Portovenere is one of the most famous and characteristic Italian small sea towns. On the first day of the Cinque Terre hiking we’ll walk along the crest of the wild coast: the Muzzerone cliff, where you can get an unforgettable panorama of the La Spezia and Lerici gulf at our right side, and of the mediterranean sea at our left side, this will be our view for the rest of the day. We’ll move the first steps from the door of the Portovenere Castle and the last at the characteristic tiny harbor of Riomaggiore along complicated and various paths, along which where we’ll only find the little village of Campiglia . The second day is the highlight of this Cinque Terre hiking. In just one day we cross the cliffs that connect all of the towns in the Cinque terre: Riomaggiore, Manarola, Corniglia, Vernazza, and Monterosso with a non strenuous walking where we can visit every peculiarity of these lovely and characteristic Unesco Heritage towns. The visit of the Vernazza castle, an incredible small medieval fortress just above the sea, is surely a must. Part of the Cinque Terre trekking winds along ancient tracks paved with original medieval big stones. An unforgettable experience with unique panoramas. The last day of the Cinque Terre hiking is the logical conclusion of this tour. 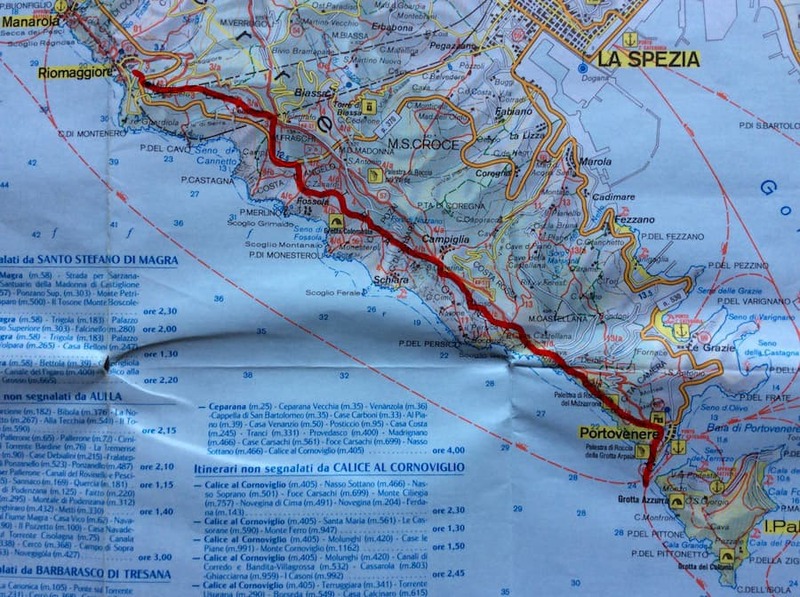 We start from Monterosso and in about 1,5 hours we arrive at the top of the “Punta Mesco” where we can see in one single panoramic view all the way we’ve walked. A great point to look at all of the Cinque Terre. 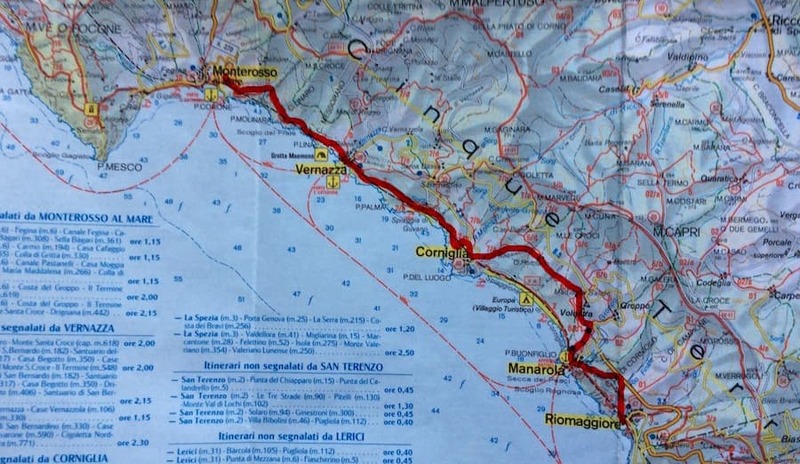 Then we continue along a wild area of the coast to the Town of Levanto, where after lunch we take the train to get back to La Spezia and from there with the local bus to Portovenere, our starting point. A last coffee in this characteristic town is mandatory to tell “ciao” to the Cinque Terre experience. The classical Cinque Terre traverse finishes here, in Levanto, but it is possible to extend the trek until Sestri Levante with others two days along the incredible Ligurian coast. If you are interested in a 4 or 5 day trek, don’t hesitate to contact me for more details. The town of Finale Ligure is a famous area for rock climbing, it’s located on the western Ligurian coast and we can arrive here in two hours by car. 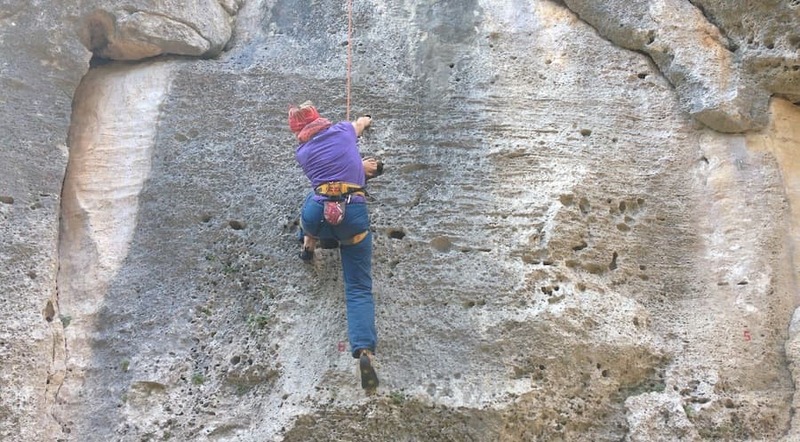 Then we can have others 2 or 3 days in Rock Climbing courses (if you are beginner) or in sport climbing and multi-pitches route on the impressive walls of the “Finalese” (the territory of Finale Ligure). Are you total beginner? Don’t worry, it’s not too late to try the experience of rock climbing! And it is a fulfillment of your hiking experience. We spend a day in a easy rock climbing cliff of the large area of Finale where I give you the full equipment, and where we learn the basic climbing movements, we try rappelling and more didattic and “adrenalinic” activities to have a complete idea of the vertical reality. Are you interested to try the via ferrata? Here in Finale Ligure it is possible! The recent “Via Ferrata degli artisti” is a good opportunity to learn this particular rock climbing technique typical of the Italian Alps. I’ll give you the complete equipment and in one day we’ll be climbing in total safety this via ferrata located in a nice and wild area of Finale Ligure. If part of your group prefers to continue with the hiking, here in Finale Ligure there are many possibility of nice daily treks. Along the wild areas of the Rocca di Corno or the Rocca di Perti and others mountains we can discover this unusual and not touristic internal area of Ligury. In any case ask me directly more information to set your personal program the best way! The amazing Ligury awaits you!